Atrapados by Oliver Jeffers is about a boy who tries to solve a problem by literally throwing things at it. Your students will find his unexpected choices to be hilarious! 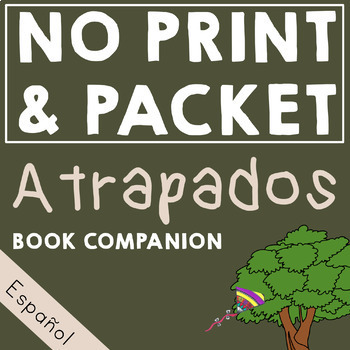 Print and Go & Interactive Atrapados Spanish Pre-Literacy Storybook Companion incorporates phonological awareness and vocabulary building drill activities in the context of whole-language storybook intervention. 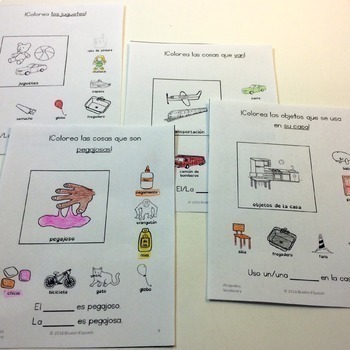 Use 47 NO PREP worksheets related to the story to supplement your awesome whole-language reading approaches! • This is a 47 printable page download (165 total pages with instructions, black & white versions, credits, and interactive/no print file). • Included are 6 phonological and language activities to be used with Atrapados by Oliver Jeffers. • This product is designed to be used as a companion to the book, not as a stand-alone product. If your local library does not have a copy of Atrapados try this video for a reading of the story or this video with Spanish subtitles. When: Use during Fall, Spring, Earth Day and when leaves are changing colors. 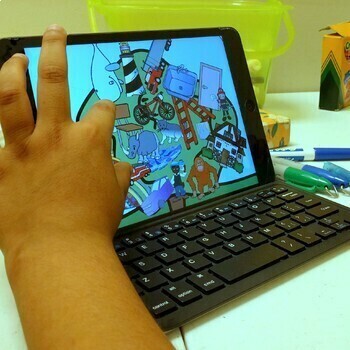 Where & How: Use in individual or small group reading and speech sessions or in RTI groups. Each activity can be used during a session. Does not include book reading time. Students draw a line to match the question and answer. Picture answers provide visual cues. Students color matching pictures while practicing rhyme words, initial sounds/blends, and syllables. Target pre-literacy skills of letter-sound knowledge. RF.K.3.A Demonstrate basic knowledge of one-to-one letter-sound correspondences by producing the primary sound or many of the most frequent sounds for each consonant. RF.1.2.C Isolate and pronounce initial, medial vowel, and final sounds (phonemes) in spoken single-syllable words. Students circle the correct prepositions by answering the WH question “¿dónde?” using the verb "estar". Students practice simple sentences using the visual cues. A BONUS interactive, no print PDF is also included for students to interact with on a computer (e.g. Adobe Reader) or tablet (e.g. iBooks). Great for telepractice as well! Students draw a line from the event that happened FIRST to the event that happened NEXT in the story. They must choose from 3 picture choices. A BONUS interactive, no print PDF is also included for students to interact with on a computer (e.g. Adobe Reader) or tablet (e.g. iBooks). Students color the items that match the category, function, or attribute. 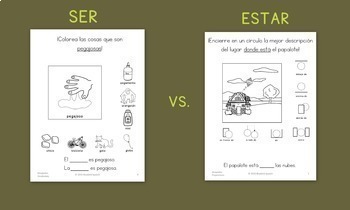 Students practice simple sentences with the verb "ser" using the visual cues. Use this Spring themed scene to aid in the understanding of the basic concepts of space, quantity, and dimension (i.e. relational words). Cut along the dotted line. Give the bottom sheet to the student. Say each clue that describes something in the scene. Ask the student to listen closely and find the image or images that go best with the phrase. Then, have them circle or color that part of the picture. Based on your feedback I have added 2 new activities! Comprehension Questions and Following Directions.